The APF6_SP is a reduced size single board computer running Linux and benefiting from impressive performances. The SP (Signal Processing) extension to the board's name indicates that this card is dedicated to embedded Linux systems requiring signal processing features. 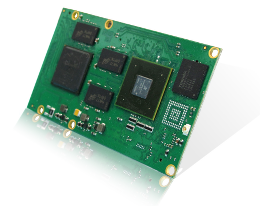 The APF6_SP is easily integrated into an embedded system. It is fitted with an i.MX6 (ARM® Cortex™-A9) processor (up to 1GHz), with 1, 2 or 4 ARM cores; a Cyclone V GX FPGA from Altera; 512 MB to 2 GB DDR3 RAM; 2 to 64 GB eMMC; a Gigabit Ethernet port; 1 USB2.0 high speed port including PHY; and one USB OTG port including PHY. Depending on configuration: the APF6_SP can have Wi-Fi wireless functionality (b/g/n) and Bluetooth 4. Note: no external debugger (BDI, JTAG) is required. When it is used with the APF6_Dev board, a simple USB wire is enough for "low-cost" development. A Linux debugger is available (GDB). (4) Available on i.MX6 dual and quad only (D and Q options). (5) Not all peripherals can be simultaneously active due to pin sharing. Please check the i.MX6 documentation for details.